With grilling enthusiasts, there is much debate regarding the benefits of both gas and charcoal cooking. Some are indifferent and are happy with either method, whereas others lean strongly towards one or the other. Outside of this, some enthusiasts swear by yet another method: wood smoking ! Wood smoking is well documented to provide better flavor for most barbecued foods. The problem is that smoking is inconvenient for most, due to the need for a separate smoker box or an add-on to an existing grill. However, there is a solution, with pellet smoking providing the perfect modern alternative to traditional wood smoking. Pellet grills are seen as the premium solution for outdoor cooking. Even if you’ve never heard of this type of grill, you will soon find that they provide clear advantages over charcoal or more modern gas grills. Pellet grills are semi-automated, using a hopper to control the flow of wood pellet, and therefore the temperature inside of the grill. 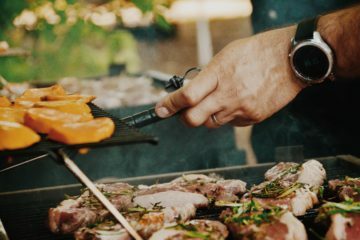 Using an electronic system, owners of these grills can control exact temperatures and cook food that simply would not be possible in a normal grill. Because pellet smokers use real wood chips, they also provide superior flavor to any other cooking method. If you want to be able to grill, sear, braise, bake, roast, and smoke with just a single cooking appliance, then looking at the best pellet grills will show you that there is a way. 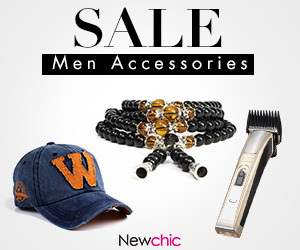 We’ve selected four different models at different price points and from different manufactures. Very few grills can rival these models in terms of versatility and quality. Different sizes are offered for your consideration, making it possible to find the best pellet grill, no matter what your needs are. If you want the very best cooking experience with no limitations, then you should be looking at one of these grills for your next purchase. A full featured pellet smoker with an integrated propane searing box, the Camp Chef Woodwind Pellet Grill offers unrivaled versatility for the grilling enthusiast who wants everything in one package. If you’ve ever felt limited by the grill that you were using, then the Woodwind Pellet Grill could turn out to be the best pellet grill for you. It not only has all of the benefits of a pellet cooker, but also features a side searing station that allows you to grill just like you would on a charcoal or gas powered grilling station. This means that it could take care of all of your outdoor cooking needs, including smoking. The cooking area on this model is generous, offering 570 square inches of total surface space. You can grill and smoke, bake your favorite pizza or even bread, and you’ll also be able to braise and slow cook your favorite BBQ recipe. Best of all, you get the full wood fired flavor that pellet grills are known for. Temperatures inside the Woodwind Pellet Grill are controlled on the electronic hopper, so you can even perform complex baking and roasting that requires exact temperatures over a long period. This grill might be considered pricey, but when you take all of the features into account, it’s actually excellent value. The fact that you can fire up the propane side grill to sear a steak or cook kebabs is a definite bonus. Construction quality on this model is excellent, putting it right up there with the best pellet grills in its price range. High quality coated steel and stainless steel is used, and the combination of black and polished surfaces will make it stand out as a feature on your deck or patio. 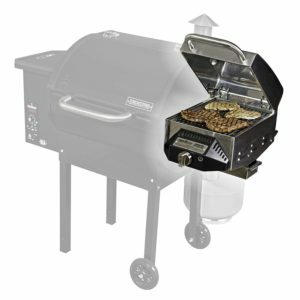 Camp Chef offers this grill with the sear box, and they also offer a separate attachment if you’re the owner of another compatible Woodwind Pellet Grill. The SmokePro BBQ Propane Sear Box can be attached to models like the PG24, PG24S, PG24LTD, and PG36LUX. 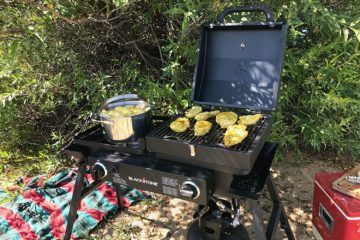 Camp Chef isn’t quite a household name when it comes to outdoor grilling, but many owners will argue that it should be. Owner reviews rate this pellet grill with an average of 4.8/5 Stars, which makes it one of the highest reviewed grills on the market today. If you are looking for something premium and unique, then this model definitely ticks all of the right boxes. One complaint that some consumers have about pellet grills is that they tend to be expensive. While this can be true for some of the high-end models, there are still options available that are relatively affordable. 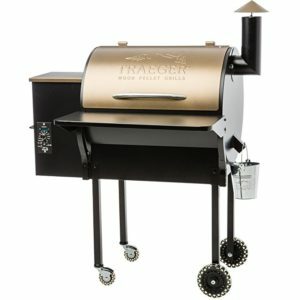 The Traeger Junior Elite Wood Pellet Grill and Smoker is the perfect example; priced below $500 and offering some incredible features if you are thinking about upgrading from a gas or charcoal grill. The basic design is intended to keep costs low, but there have been no corners cut when it comes to quality of construction and the materials that are used. The bronze finish is both attractive and unique, and it will make this grill a talking point at your next cookout with friends or family. Like all of the best pellet grills that we have included in this list, the Traegar Junior Elite is a versatile outdoor cooker. 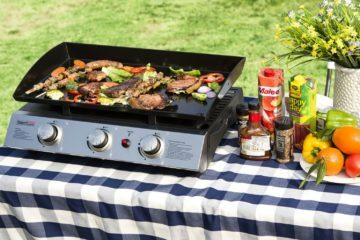 The electronic hopper can be used to control temperatures that range from low smoking, right up to searing heat for fast grilling of steak and burgers. If you’re looking for something in-between, then you can set the appropriate temperature and cook a whole chicken, or even a wood fired pizza. There’s 300 square inches of cooking surface on this model, making it perfect for family use and for cooking when guests are around. To put that surface size into perspective, you could cook two chickens, a medium sized turkey, two or three racks of ribs, or up to twelve burgers. Cooking consistency on this model is nothing short of amazing. 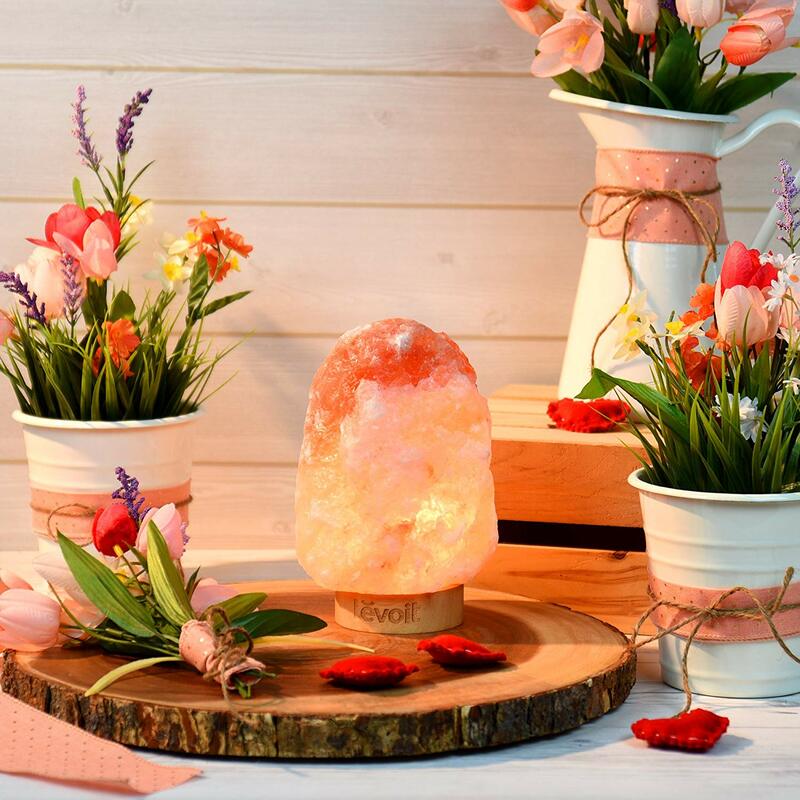 The temperature gauge is highly accurate, and you’ll never have to worry about constantly adjusting gas or refilling charcoal. Because the electronic hopper continuously regulates the fuel, you will only need to worry about the actual cooking. You’ll love the consistency of the results that you get on this grill, and your family and friends will love the food that you serve. To put it quite simply, this is a high quality grill that is a pleasure to cook on, and it would be a great addition to your home if you are ready to step up from standard gas or charcoal cooking. If you like everything that you’ve learned about the Junior Elite, then you’ll also want to take a look at the Traegar Grills Lil Tex Elite 22 model. This is another strong contender for the best pellet grill on the market, offering everything that the smaller model has, but increasing the cooking size up to 418 square inches. 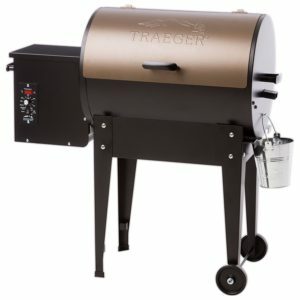 The same high quality materials are used in the construction, and it features Traeger’s signature black and bronze design. Having more space can expand your cooking options, allowing you to grill and smoke larger cuts of meat, bigger birds like larger turkeys, or you could simply use it to cook more of your favorite food at the same time. This is the one to go for if you like the Traeger design but want more flexibility for bigger cooking sessions. This will be your go-to cooking appliance when you are hosting friends and family, having a sports night, or during holidays throughout the year. One of the advantages of a fully enclosed pellet grill is that it can be used at any time of year, without having to worry about the temperature outside. The electronic system will ensure that internal temperatures are consistent at all times. As long as your grill is under cover, then you’ll be ready to start cooking. 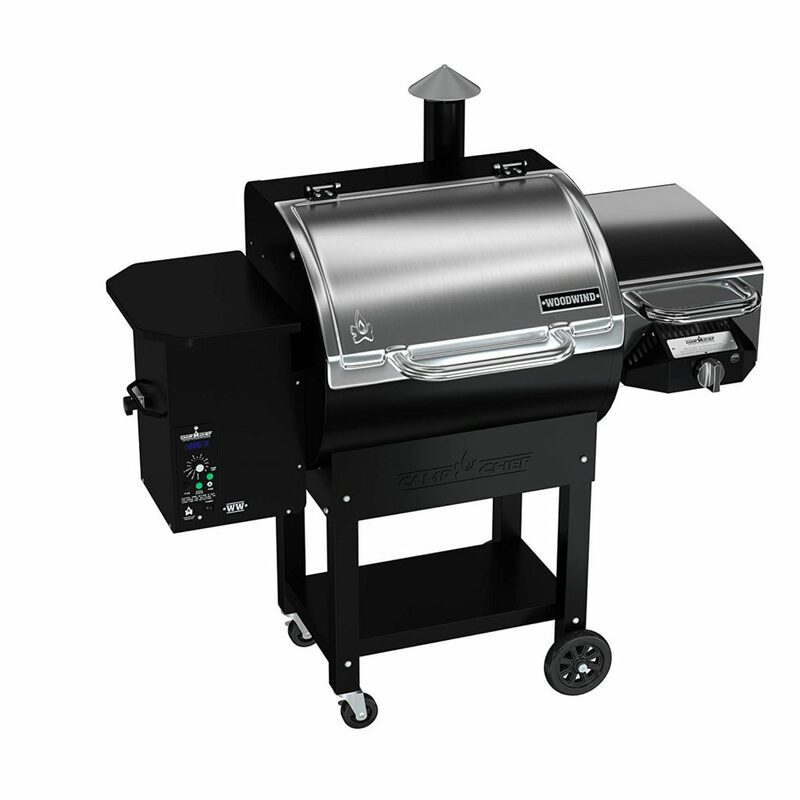 Like the smaller model, you can roast, smoke, grill, braise, BBQ, and bake on this grill. If you’ve been waiting to try a delicious wood fired pizza, a large smoked brisket, or any kind of BBQ that wasn’t possible on your old grill, then you will love what can be achieved on a Traeger. This grill has had strong and consistent customer feedback, with owners rating it an average of 4.6/5 Stars. It deserves its place amongst the best pellet grills on the market. When you need the largest possible cooking surface with a high quality grill, the Louisiana Grills LG900 Pellet Grill is the best option for you. Offering 913 square inches of cooking area, this is the big daddy of grills. It would be perfect if you consider yourself a real grilling and smoking enthusiast. It’s also a great option if you regularly entertain large groups of friends and family. One of the first things that you will notice about the LG900 is its back to basics design. There are no exaggerated features like smoke stacks, no side shelves, and nothing else that suggests the premium nature of the grill. What you do get is a classic barrel design with a side hopper and an underside tray. Don’t take the basic design to mean that this is a basic grill, as that’s definitely not the case. Rather than spend time on flashy design, Louisiana Grills has focused on making the best pellet grill possible. High quality steel is used throughout the construction, and the heft and quality fit of the individual components will be reassuring when you are looking for a quality grill that is more of an investment than a casual purchase. This model is completely black with only some minor polished steel accents. The grill looks like it is a serious BBQ tool, and it certainly is. 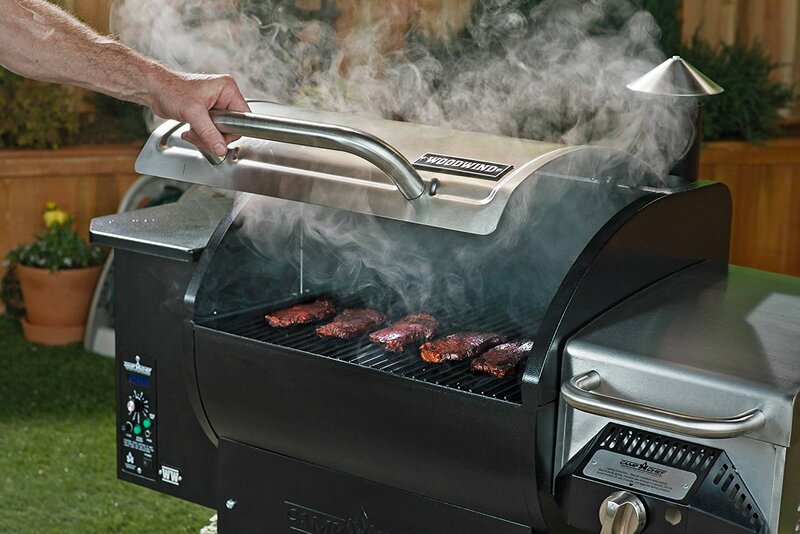 The electronic hopper in this grill is complemented by a powered fan that forces circulation throughout the main cooking chamber. Air moves around the barrel design for effective convection cooking, which results in juicy cuts of meat, as well as highly efficient baking and roasting when you need it. Whatever you love to cook, whether it’s pizza, beef brisket, or a full sized turkey, you will have no trouble on the LG900. Of course, you can also cook all of the classics like hot dogs, burgers, steaks, kebabs, vegetables, and anything else that you can imagine. This is a chef-grade cooking tool that takes inspiration from professional grills and smokers. With the right wood chips, you’ll love the flavor that you get when cooking on this Louisiana Grill. Most impressive is the fact that the digital control on this grill allows for temperatures between 170F and 600F. This exceeds most grills and smokers on the market today. The LG900 is the middle of the range, so you do have other options if you need something smaller or larger. The Louisiana Grills LG700 offers just over 700 square inches of cooking surface, while the LG1100 offers 1100 square inches of total surface area. Each grill follows the same design, with the only difference being the cooking capacity. Pellet cooking is often described as the peak of outdoor grilling. 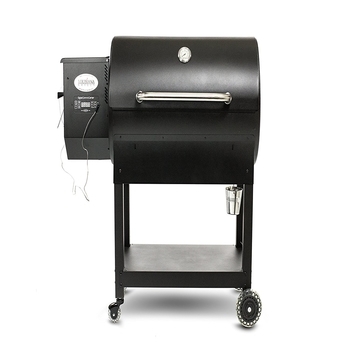 The best pellet grills combine the features of a grill and a smoker in one package. You will get high heat settings, direct control over temperature, and the unmistakable smoky flavor of real wood pellets. Make your choice based on your size and budget needs, and you’ll find that pellet cooking gives the satisfaction that both gas and charcoal cooking cannot come close to.